It is with such enormous gratitude that I write about a recent trip I took to Italy. Earlier in May, I had the honor to visit Rome, Florence, Padua, Venice, and then go to a cooking school in Umbria. By the end, Italy was embedded deep in my soul. The places and people have filled the creative well for me. Which is why I am blogging about it here. Visiting foreign lands and learning and experiencing and seeing and meeting new things and people is so refreshing, and can be hard to come by in “real life.” Travel is like a reminder: there’s a big wide gorgeous world out there that you are a part of! Go experience it, and let it become a part of you and what you create in the world around you. On Italy specifically, I can’t describe everything, and quite frankly this post would be ridiculously long and you’d be better off reading about such things from a lovely travel expert like Rick Steves anyway. So instead I want to write here about a particular moment I experienced. It was our last afternoon in Florence. I wanted to stop in to see the Medici Chapel, where some of Michelangelo’s most beautiful sculptures live. As we ambled up to the chapel door at 4:30pm, it was at that moment we realized the chapel had closed fifteen minutes earlier. I and another heartbroken tourist looked at each other with wide eyes, knowing we were half way across the globe and would not have this opportunity again… deep breath, silence…. Damn. Of course, there was a solution! Our train left bright & early from Florence the next day, but there would still be time for me to get to the Chapel just as it opened. And this solution was the best thing that could have happened. That morning, I packed my suitcase and left it with my travel-mates at the monastery we were staying at, and sauntered my way over to the chapel….long before it opened. Just to be safe. Which was a beautiful opportunity to walk into a Florence coffee bar and order a tasty doppio to sip as I sat on the stone benches, ogling the gorgeous architecture, cooing pigeons and hurried locals going to work. As soon as the chapel opened, BAM: I, along a few other die-hards, made my way in. There was of course a lot to see there. So much Medici history. I glossed over it, a bit sadly, with so little time before my train. I half-hurried / half-mosied my way through a crypt and a stunning chapel until I got to the New Sacristy where Michelangelo’s sculptures Dawn, Dusk, Night and Day reclined over the tombs of Medici greats. And stopped short. There I was, alone with these epic marble master works. What an experience to be with these beings Michelangelo created. My heart filled up and ran over. It was just us. Quiet….and tremendous. One of my colleagues here at my day job calls this kind of travel soul-expanding. (As opposed to a vegetable vacation of the sit-on-the-beach-and relax ilk. Equally wonderful. Totally different). Soul-expanding vacations fill the creative well. And they are just *needed* - you feel that well fill up inside, you feel part of this world and learn new things about this world and …that is just incomparable. P.s. 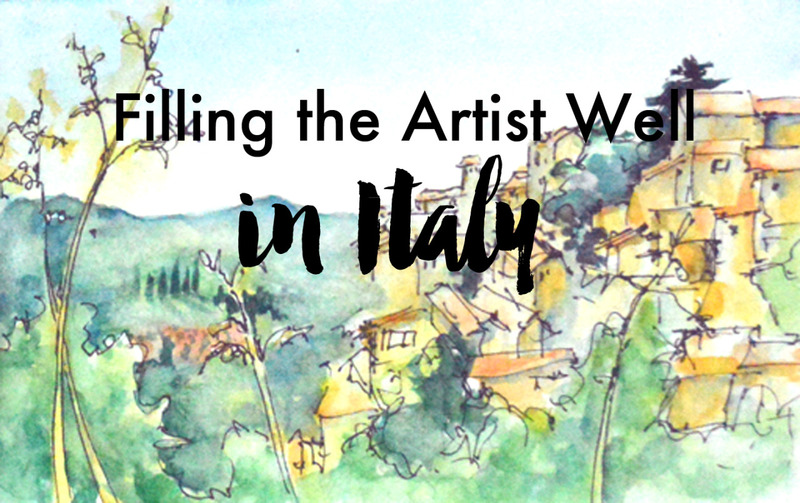 I invite you to visit these epic places alongside me, and hopefully feel all that awe I felt via my travel sketchbook: Rome! Florence! Padua! Pigeons! Espresso makers! Strange fruits! Cows! It’s all in there. And if you haven’t experienced the joy of travel sketching yet, I urge you to read this blog post.